Defence lawyer Will Harris is reluctantly drawn into a bizarre murder trial. A terminally ill man claims to have witnessed the brutal crime – in a vision. But the looming trial is more than just a media circus: it’s Will’s first big case since the tragic death of his fiancée. With the pressure mounting, Will’s loyalties are split when his fiancée’s sister is charged with drug trafficking. The strain of balancing both cases takes its toll and Will finds himself torn between following the law and seeking justice. Apart from the engaging, anti-hero protagonist and insight into Melbourne’s social and criminal worlds, what particularly interests me about this book is the way Hammond weaves in an obscure legal precedent from Britain. Hammond uses the (fictional?) case of ‘R. v Lam’, which touches on the late nineteenth-century fascination with spiritualism, both to develop intriguing plot points and moments of suspense, and also to shed light on the workings of the Australian legal system. His insights, no doubt, draw on his own background as a lawyer. Silence from Toby was indicative of nothing. He could be content or plotting a furniture-oriented revenge. The driver turned on the mechanism and Kovacs slowly started to rise and rattle like a bad effect from a horror movie. While the plot is page-turning and rarely flags, as it progresses it does stretch credulity. Still, Hammond’s ‘scientific’ explanation at the end, which makes sense of some of the wilder aspects of the narrative, should satisfy sceptical readers and justify their suspension of disbelief. 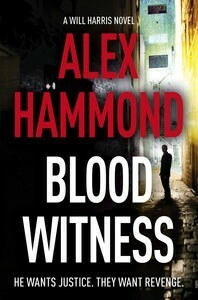 Likely to appeal to fans of Law & Order, Rumpole and Rake alike, Blood Witness is overall a very good read. I’m looking forward to Book 2 in the series. Sounds like a great read, Elizabeth, especially as as 19thC spiritualism is one of my research fields & it will feature in the novel after my current one – looks like a trip to to the bookstore is in order! Really? What a great research area. Have you read Hawthorne’s Blithedale Romance? That was one of the first US novels that I came across that touched on the subject. I did, too! Couldn’t find it, either. I wonder if Angela Savage will ask him about it in her interview? I might ask her to. I love a good twisty legal thriller and 19 Century Spiritualism is a fascinating area. Have you read Margaret Atwood’s Alias Grace, Elizabeth? I haven’t read Alias Grace, though I heard part of an audio version on the radio. I go hot and cold on Atwood (didn’t much like The Blind Assassin). From memory, Alias Grace was based on a true story, wasn’t it? Yes it was, I believe. I didn’t love the blind assassin either, but alias grace was one of those extraordinary books that’s outside anyone’s usual output – or at least, that’s how I experienced it. I hadn’t heard of Atwood before I read it and I thought, for some reason, that it was a debut novel – and I wanted to kill myself with despair. Then I found out otherwise and I decided to live and give this writing thing a stab after all. ;). Worth a look, I think, bearing in mind that recommendations are always fraught! What an anxiety of influence that must have been! Glad you weren’t discouraged and pressed on, Imelda. I’ll keep Alias Grace in mind for my towering ‘To Be Read’ pile.